After a terrible winter of lots of snow, it is exciting to see the trees start to bloom and the crocus push their way toward the light. Hopefully, many of you have spent countless hours at your table practicing letters, making handmade books, broadsides, etc. I spent two days home from work sewing on a quilt for my 11-year old granddaughter’s bed and when the furnace went out, probably from too much work this winter, I got to sew the binding on the quilt and complete it. You have to think out of the box when the saying, “make hay while the sun shines” comes to mind. Our January meeting was cancelled due to the snow and bad roads. 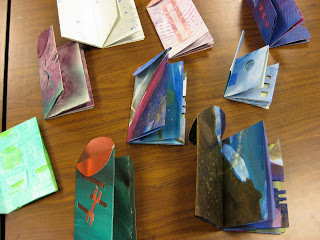 At our February meeting we met from 10 am until 2 pm recreating the Rosie handmade books that we first made last November. These four to six hour get togethers allow us to have some extra time together to complete more projects. It is like an extended make it/take it and we all have something to show for our time together. For our March meeting, we made a Rosie card that we learned to do about 1 ½ years ago and, thanks to paste paper, we can create a lovely card to send out to someone special. As I have stated before, our study group began over 10 years ago and is still getting stronger. We have evolved from bringing something to show once in a while to creating lovely art work together. In June we will be getting together for the day to recreate the Jackie Sullivan technique so be sure to join us for a BIG make it/take it workshop. 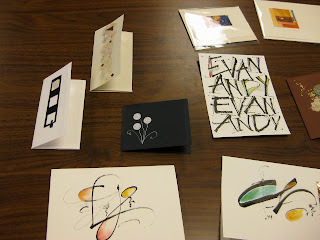 MCG Blog – Shannon Wilson has created a blog for the Michiana Calligraphy Guild, www.michianacalligraphy.com. A variety of features will be included on the MCG Blog, pictures, supply lists and any other information you will need to know during the course of the year. The blog has been up and running since the end of December. Thanks Shannon for all your hard work in creating this for us! And, speaking of Shannon,…..we want to wish her and her family many blessings as they move to New York State. We will miss you Shannon! Amber Schindler and Renee Tuveson will be taking over the duties on the MCG blog. Marianne Burke –Marianne Burke from Kentucky will teach us a handmade book class a few days after you read this newsletter so, if you haven’t signed up yet, please contact Ginny Vander Hey (gvanderhey@hotmail.com). Marianne makes beautiful handmade books and will be here on Saturday, April 2, 2011 at Christ the King Lutheran Church from 9 am – 5 pm. The cost of her class will be $30. A supply list will be sent to you upon registration in the class. 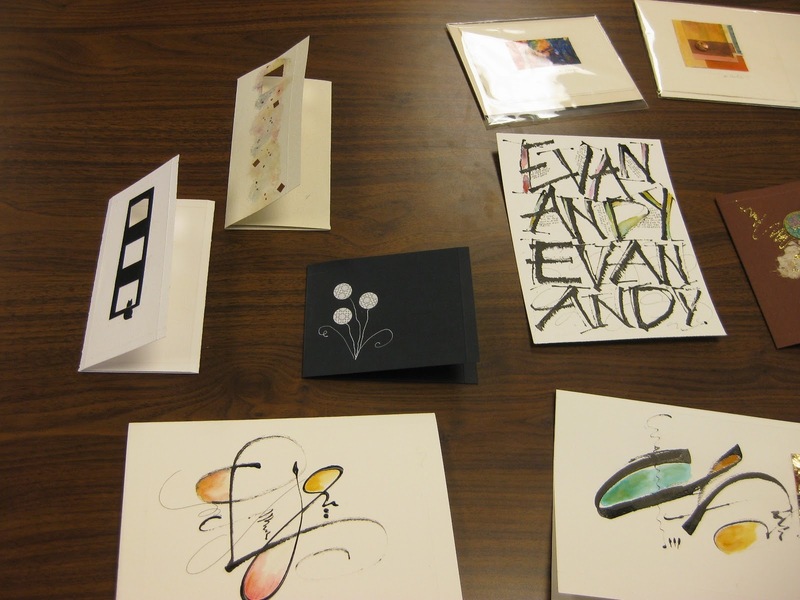 Linda Bravata – At the March 5 meeting, Anna Schlemma brought cards that were made in a workshop in Kalamazoo on February 5. The cards were stunning and it was a unanimous vote that we get Linda as soon as possible to teach us how to do these wonderful pieces of art. We are happy to announce that Linda will be teaching a workshop on Saturday, April 16, 2011, from 9 am until 5 pm at Christ the King Church. The cost for this workshop will be a very affordable price of $23. which will include the supply fee from Linda. This class has a limited size, so contact Ginny Vander Hey (gvanderhey@hotmail.com) ASAP. We know this is short notice and that it follows the Marianne Burke workshop, but this is the best date we could get with Linda and her busy schedule. We all send out many cards every year and learning new skills from Linda will enhance our card making abilities for the future. Supply list will be sent upon registration. Rosie Kelly – We are hoping to have Rosie come back to South Bend in the fall, date TBA, to teach us another handmade book. Date, cost and supplies to be announced. Louise Grunewald – Judy Bruzza kindly sent us some of Louise’s work. We are excited that Louise can come to South Bend for a workshop on October 29 & 30, 2011. Louise is a talented artist that works in marks and watercolors. More information will be forthcoming regarding cost, supplies and workshop times. Please put October 29 and 30, 2011 on your calendar for this workshop. Cost TBA. American Frame – Just a reminder that if you order from American Frame, please mention MCG and they will give us a small stipend. October and November are TBA’s because we want to have Rosie Kelly and go to St. Mary’s to see the St. John’s exhibit. We just don’t know which one will be which. We will have that information soon. Please note that some of the meetings are not on the first Saturday of the month due to holidays or workshops. Cut this part of the newsletter out and put it on your fridge. In June, 2011 we will again be watching the Jackie Sullivan DVD and recreating at the same time. We did this last year, and many of our members took home masterpieces! I cut mine up to make cards since I didn’t get the masterpiece that day. But, it was used nonetheless. We will let you know what supplies you need to bring as it gets closer to June. Anne Binder has asked me to help spread the word about a calligraphy retreat that will be held at the Bergamo Retreat Center in Dayton, OH June 5 to 9th. The center sits on 150 acres of land with wooded trails, a labyrinth, Grotto, and boasts of wildlife. The facilities are modern and all rooms have private baths. Silent Words has arranged for workshops with Jacqueline Sullivan, Judy Melvin, Sheila and Julian Waters, and Rosie Huart. Participants may also opt which instructors they wish to take. Or, like Anne, can opt not to take classes, but instead using a private workroom for the week as her own studio. Anne is willing to share a table or two! The cost is very reasonable. Space is limited to 60 so the retreat is meant to be intimate and informal. Give it some thought! The Pen Dragons of Kalamazoo will be hosting Barbara Close for a workshop on September 17 & 18 and another workshop with Barbara on September 19. Check out her website to see her work: http://www.bcdezigns.com/BCgallery.htm. The Pen Dragons are very warm and welcoming when you are part of their workshops. They usually fill their workshops so if you are interested in being a participant, you may want to consider being a Pen Dragon member to get first dibs! The 25th Annual Juried Exhibition of the Chicago Calligraphy Collective will be held from March 21 until June 25, 2011.at the Newberry Library in Chicago, Illinois. The opening reception will be on Saturday, April 9, 201 from 11 am until 3 pm. Calligraphy demonstrations and activities from 11:30 am until 1 pm. Last March a group of us took the train into Chicago and had a wonderful day at the reception seeing the demos from four talented artists. The juried calligraphy is beautiful and motivating. If you get a chance to be in Chicago, don’t miss this once a year event!